from midsummer to spring. Beyond this period an out-of-season inflorescence is always a possibility. The individual flower is large and showy with a slightly upturned apex, giving the raceme special appeal. Because there is normally a lot of green left in other garden plants and lawns when ‘Totem’ starts flowering, it tends to make the flowers stand out just a little more, compared to midwinter inflorescences when the background tends to be somewhat bleak. The dark green leaves are rather thin and lined with prominent, pale spines. Stem shoots may occasionally appear on the tall trunk. 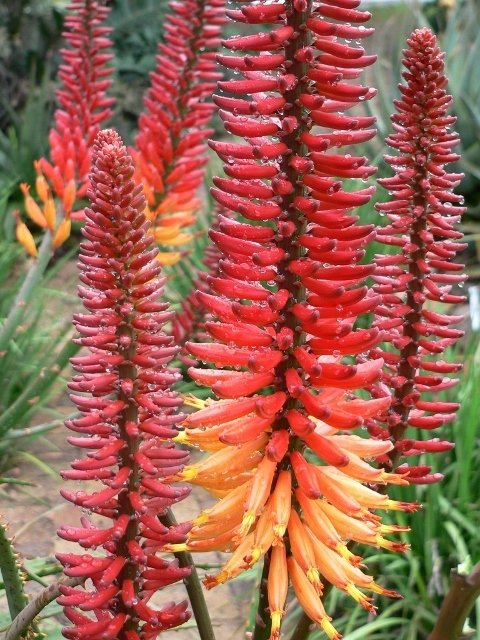 I recommend the removal of all such shoots as they tend to spoil the statuesque lines of the aloe. Although it may only happen after a few years, rosette division should be welcomed by the gardener as it makes for better flowering. Although ‘Totem’ can easily start it life in a large pot (the plants flower from a young age) this would just be postponing the inevitable move to open soil planting. The plant becomes just too tall for a container.